I created this card using a fantastic new image released at the Whimsy store created by Marika Collins called Hope. 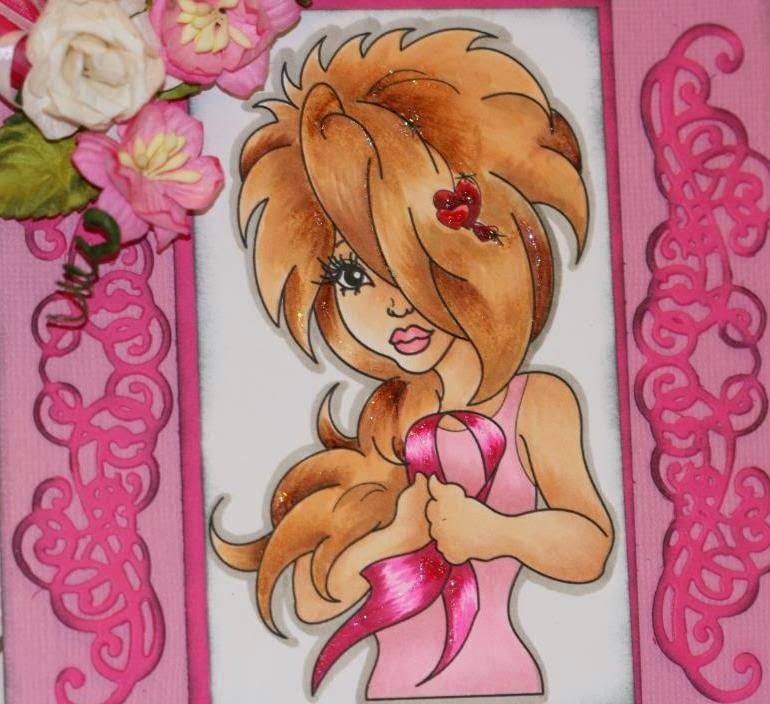 This is a wonderful image honoring breast cancer, so I thought that the card should be bold and have a big statement and have a lot of pink. I think I have accomplished that, I think we have all been touched by someone in our life that has struggled with some form of cancer. So with this card I honor each and everyone of them. Supplies: Bazzill cardstock, Momenta patterned paper, Whimsy mini lace corner doily 1 die, spellbinder cut a mat create 2A, copic markers, miscellaneous flowers, Prima leaves, Stardust Stickles by Ranger, distress ink. Have a fabulous day and keep creating. So pretty, you love that pink/grey. The image awesome, great sparkle in her hair. Nice flowers as always, great job! I like the ribbon in her hand...Very nice!